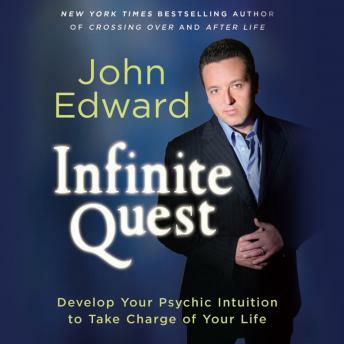 Internationally acclaimed psychic medium and best-selling author John Edward has captivated audiences worldwide with his unique abilities to connect people with loved ones who have crossed over to the Other Side. Now in this groundbreaking book, John takes you on an infinite quest to develop your own psychic intuition as a powerful tool for taking charge of your life. John believes that everyone has intuitive energy and psychic potential - for instance, many of us can recall knowing that the phone was going to ring and who it was on the other end, or we will "get a feeling" about something. That "feeling" is psychic energy. His goal is to help you understand your intuitive potential and tap into it to take chances and make choices with confidence. By following certain guidelines and intuition-building exercises on this meta-physical journey, we can learn to get in touch with our Spirit Guides and identify the psychic energy around us on deeper levels - including connecting with the energy of those who have passed. John also explores the importance of psychic self-defense and reveals how divination tools like numerology and tarot cards can further assist you on your path. Like John's new website that gives this book its name, Infinite Quest is truly a "portal to all things metaphysical."